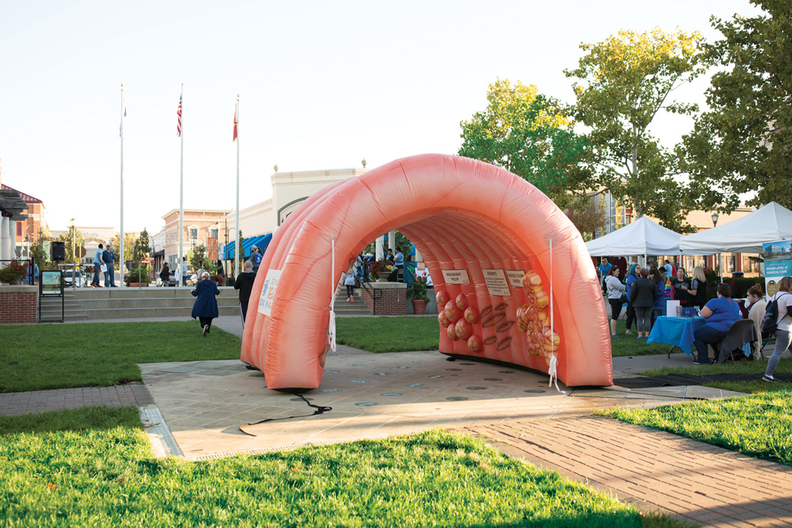 The inflatable colon has been a regular feature at community events and health fairs. It's 10 feet long, weighs 150 pounds and delivers a cancer awareness message. And it's missing. A giant inflatable colon used to teach about the dangers of colon cancer was recently snatched from a pickup truck in Kansas City, Mo. The purloined publicity prop belongs to the Colon Cancer Coalition, a not-for-profit that is reaping a wave of publicity from the offbeat theft. The pilfered inflatable even has its own social media hashtag, #stolencolon. “While we are missing our educational tool, the publicity and awareness that is being brought to colon cancer is a huge bonus. Awareness is the goal of the giant colon. We use it to start conversations. To that end, our poor stolen colon has done its job—but we still want it back,” Erin Peterson of the Colon Cancer Coalition, told WKRC. The inflatable organ was purchased with funds raised at “Get Your Rear in Gear-Kansas City” events, and has been shipped around the Midwest for educational and community events. “Get Your Rear in Gear” walking and running events are the coalition's signature activities, with about 40 held annually across the country. For now the coalition is trying to raise the $4,000 needed to buy a replacement colon.